"Male and female created he them; and blessed them, and called their name Adam, in the day when they were created" (Genesis 5:2). 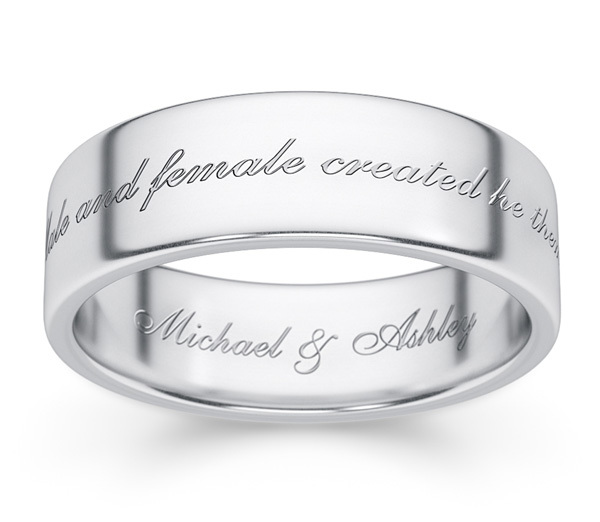 The words, "male and female created he them" from the King James Bible is engraved on the front of the band in our unique script font with your names personalized on the inside of the sterling silver band. The Christian Bible verse ring is made from pure .925 sterling silver and is also available in white gold or yellow gold, shown below. Choose from 6mm to 8mm width (shown here in the standard 6mm width). The ring is available in men's or women's sizes. We guarantee our "Male and Female Created He Them" Silver Wedding Band Ring to be high quality, authentic jewelry, as described above.